1930: opening of the Tôkyô Gekijô in the district of Tsukiji. 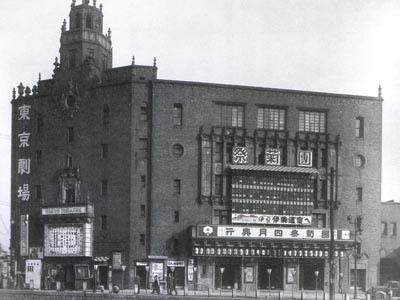 It is a modern 1898-seat theater, which is managed by the Shôchiku and designed for Kabuki, Western Operas or movies. September 1933: premiere at the Tôkyô Gekijô of the Nagauta-based kyôgen "Takatsuki", which is adapted for Kabuki by Hisamatsu Issei (lyrics) and Kashiwa Izaburô (music) and performed by Onoe Kikugorô VI and Bandô Mitsugorô VII. April 1934: premiere at the Tôkyô Gekijô of Kimura Tomiko's Tokiwazu-based dance "Hanami Yakko", with a choreography and a musical accompaniment made by Hanayagi Jusuke II and Tokiwazu Mojibê III. The leading role of the yakko is played by Ichikawa Ennosuke II. January 1935: premiere at the Tôkyô Gekijô of "Edojô no Ninjô" and "Daini no Shisha", the first and second plays of Mayama Seika's cycle "Genroku Chûshingura". April 1935: premiere at the Tôkyô Gekijô of "Saigo no Daihyôjô", the third play of Mayama Seika's cycle "Genroku Chûshingura". April 1936: premiere at the Tôkyô Gekijô of "Ninin Sanbasô", a 2-dancer version of the Sanbasô dance, starring Ichikawa Ennosuke II and his son Ichikawa Danshirô III. February 1939: premiere at the Tôkyô Gekijô of the second act of "Sengoku Yashiki", the ninth play of Mayama Seika's cycle "Genroku Chûshingura". April 1941: premiere at the Tôkyô Gekijô of Kimura Tomiko's Gidayû-based dance "Yoi Yakko". The leading role of the yakko Bekunai is played by Ichikawa Ennosuke II. November 1941: premiere at the Tôkyô Gekijô of "Sengakuji", the eighth play of Mayama Seika's cycle "Genroku Chûshingura". 10 March 1945 (00:08 AM): 344 US Army B29 bombers drops 2,000 tons of bombs on Tôkyô, killing more than 120,000 people and destroying almost everything; the Tôkyô Gekijô is the sole standing theater in the devastated city. February 1946: Ichimura Kakitsu VII and Ichimura Matasaburô II take at the Tôkyô Gekijô the respective names of Ichimura Uzaemon XVI and Ichimura Kakitsu VIII. A big thanx to Sekidobashi Sakura for her help! September 1949: Ichikawa Somegorô V and his son Matsumoto Kintarô II take the respective names of Matsumoto Kôshirô VIII and Ichikawa Somegorô VI at the Tôkyô Gekijô. 1952: the Tôkyô Gekijô becomes a movie theater. 1975: the Tôkyô Gekijô is rebuilt and modernized. Its name becomes Tôgeki.